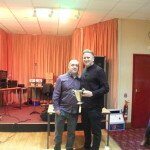 Jamie Wyer, winner of the club doubles with Simon Homer, receives his trophy. 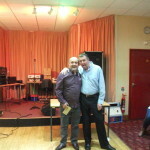 Mick Price presents a cheque to runners-up Phil King. 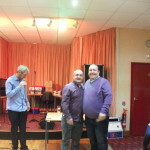 Semi Finalists Ade Smith and Dave Price. 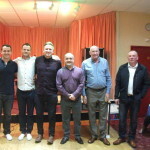 Quarter Finalists in the doubles from left, Alisdair Jarvis, Nick Mullinder, Mark Taylor, Mick & Colin Price. 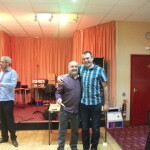 Club Championship winner Mark Taylor. 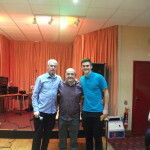 Semi Finalists Phil King and Ash Gregory. 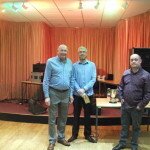 The Club Championship’s Quarter Finalists Jim Fletcher, Rob Burroughs and Nick Wyer with Ade (second left). 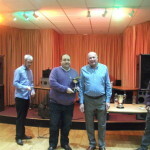 Rob Burroughs, winner of Team Averages and best 6 wins in the Premier, Summit and Dennis Lewis leagues. 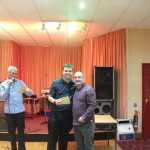 Ash Gregory winner of Wem Team Averages and best 6 wins. 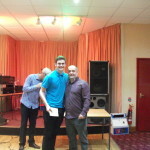 Alasdair Jarvis won best 6 wins for Division One and Five, and also the Team Averages in Division 5. 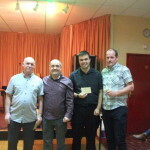 Lee Bowden winner of Division One Team Averages. 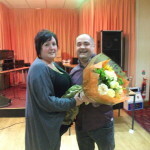 Annette thanks her husband Neil for all the support he has given throughout the season. 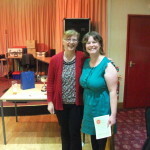 Annette presents the best 6 wins to joint winner an daughter Rhian Harding. 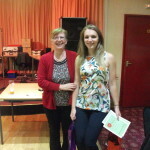 Annette Harding (left) presents a prize to Ladies Team Averages winner Carleen Doody-Millington. 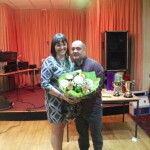 Ade presents Kirsty Gregory with flowers for her marking skills. 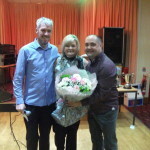 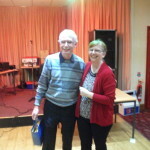 Chairman Phil King (left) helps Ade present flowers to his wife Tracey for her help throughout the season. 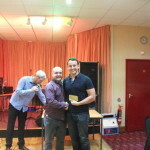 Well done to all teams and players on a successful season.